Written to accompany movies screened by the Radio-Television-Film Department at the University of Texas, the CinemaTexas Notes open a fascinating window on the early Austin film scene and the rise of film studies. Austin’s thriving film culture, renowned for international events such as SXSW and the Austin Film Festival, extends back to the early 1970s when students in the Department of Radio-Television-Film at the University of Texas at Austin ran a film programming unit that screened movies for students and the public. Dubbed CinemaTexas, the program offered viewers a wide variety of films—old and new, mainstream, classic, and cult—at a time when finding and watching films after their first run was very difficult and prohibitively expensive. For each film, RTF graduate students wrote program notes that included production details, a sampling of critical reactions, and an original essay that placed the film and its director within context and explained the movie’s historical significance. Over time, CinemaTexas Program Notes became more ambitious and were distributed around the world, including to luminaries such as film critic Pauline Kael. This anthology gathers a sampling of CinemaTexas Program Notes, organized into four sections: “USA Film History,” “Hollywood Auteurs,” “Cinema-Fist: Renegade Talents,” and “America’s Shadow Cinema.” Many of the note writers have become prominent film studies scholars, as well as leading figures in the film, TV, music, and video game industries. As a collection, CinemaTexas Notes strongly contradicts the notion of an effortlessly formed American film canon, showing instead how local film cultures—whether in Austin, New York, or Europe—have forwarded the development of film studies as a discipline. Black was one of the original writers of the CinemaTexas Program Notes. He cofounded The Austin Chronicle, where he was the editor for thirty-six years, and SXSW, where he is a director, and was a founding board member of the Austin Film Society. He has written extensively on film, music, and politics. In 2016, he and Karen Bernstein directed the documentary Richard Linklater: Dream Is Destiny, which made its world premiere at Sundance Film Festival. 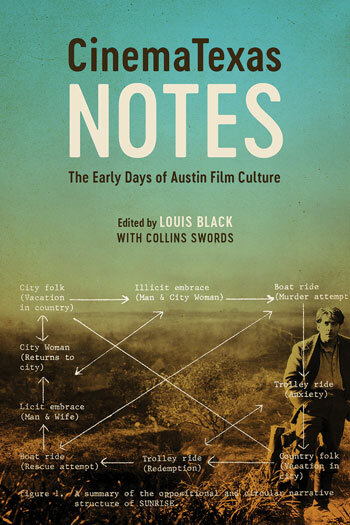 A recent MA graduate of the Department of Radio-Television-Film at the University of Texas at Austin, Swords is a creative assistant to Louis Black, with whom he works in project development, promotion, outreach, editing, and archival research. "Put this on your Austin shelf next to Alison Macor's essential history, Chainsaws, Slackers, and Spy Kids, and Mike Blizzard's documentary film Also Starring Austin. . . . Along with a bit of history, we are lucky enough to read in this book the incredibly well-researched—especially for the pre-internet days—program notes from CinemaTexas days."